International Silver Co. Flatware, DEEP SILVER, Silverplate "ORLEANS" pattern, 1964-1992 Discontinued, 8 7/8" Cold meat fork, 1 available.Beautiful condition, no wear. See other pieces to this pattern I have listed.Rogers also made this pattern. 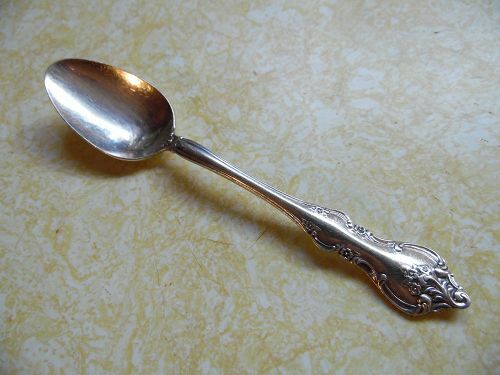 International Silver Co. Flatware, DEEP SILVER, Silverplate "ORLEANS" pattern, 1964-1992 Discontinued, 6 3/8" Pierced / slotted serving spoon, 1 available. Beautiful condition, no wear. See other pieces to this pattern I have listed. International Silver Co. Flatware, DEEP SILVER, Silverplate "ORLEANS" pattern, 1964-1992 Discontinued, 5 7/8" teaspoon, 5 available. Price is for each.Beautiful condition, no wear. See other pieces to this pattern I have listed.Rogers made this pattern also. International Silver Co. Flatware, DEEP SILVER, Silver plate "ORLEANS" pattern, 1964-1992 Discontinued, 7 3/8" dinner fork, 6 available. Price is for each. Beautiful condition, no wear. See other pieces to this pattern I have listed. 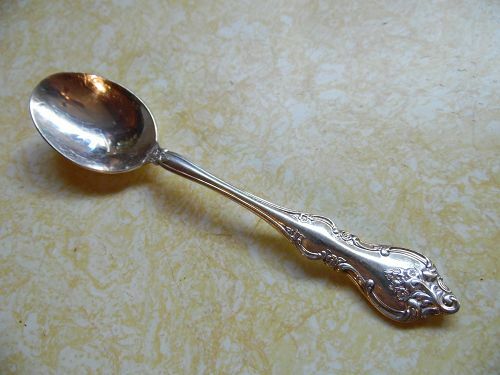 International Silver Co. Flatware, DEEP SILVER, Silverplate "ORLEANS" pattern, 1964-1992 Discontinued, 6 3/4" Oval place soup spoon, 6 available. Price is for each.Beautiful condition, no wear. See other pieces to this pattern I have listed. Rogers made this pattern too. International Silver Co. Flatware, DEEP SILVER, Silverplate "ORLEANS"
International Silver Co. Flatware, DEEP SILVER, Silverplate "ORLEANS" pattern, 1964-1992 Discontinued, 6 5/8" salad fork, 5 available. Price is for each.Beautiful condition, no wear. See other pieces to this pattern I have listed. 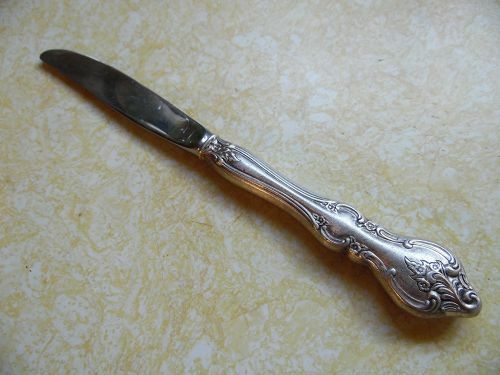 International Silver Co. Flatware, DEEP SILVER, Silverplate "ORLEANS" pattern, 1964-1992 Discontinued, 9 1/4" Hollow handle modern knife, 7 available. Price is for each.Beautiful condition, no wear. See other pieces to this pattern I have listed. 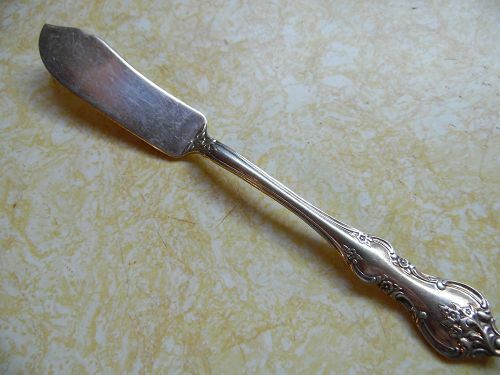 International Silver Co. Flatware, DEEP SILVER, Silverplate "ORLEANS" pattern, 1964-1992 Discontinued, 6 3/4" flat handle master butter knife spreader, 1 piece. Beautiful condition, no wear. See other pieces to this pattern I have listed. International Silver Co. Flatware, DEEP SILVER, Silverplate "ORLEANS" pattern, 1964-1992 Discontinued, 8 7/8" solid shell casserole Spoon, 1 piece.Beautiful condition, no wear. See other pieces to this pattern I have listed. 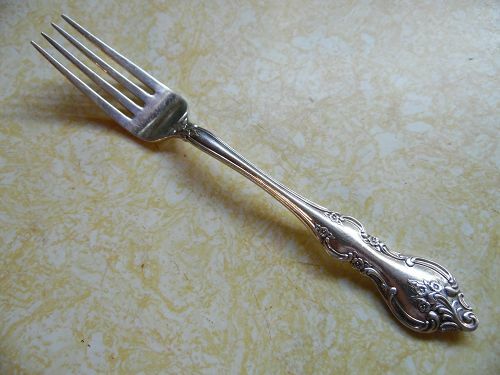 Antique 1847 Rogers Bros Silverplate - Embossed Pattern - Nut Pick, Lobster, Shellfish, Escargot Pick. 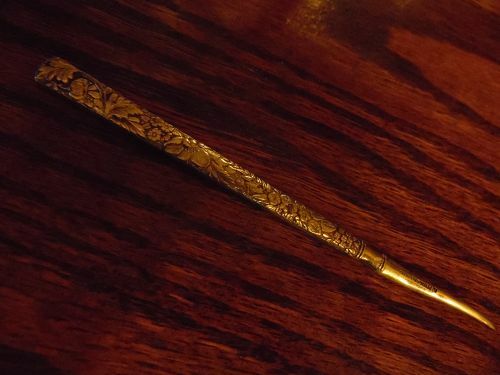 5" inches long (12.7cm) This beautiful pick-utensil has been lightly cleaned but not polished. The handle is a beautiful floral chintz design in the 'Embossed' pattern designed in 1882. The Rogers Bros 1847 mark is clearly stamped as shown. There are no bends, dents or repairs. A lovely pick, whatever the task. 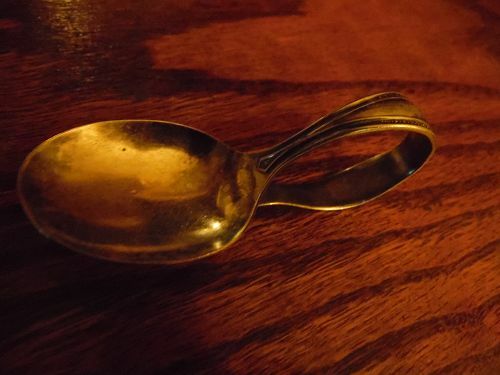 Vintage 1929 silver plated baby spoon with the curved handle. This pattern known as Commodore, York, or Palmer, was by designer Sidney James. Marked Simon L & George H Rogers Company, Pat date Dec 14, 1915. Great condition just needs a little polishing again, No dents, deep scratches, bends, pits, or wear. A lucky little lady is going to serve tea to her dolls in the most elegant style imaginable. 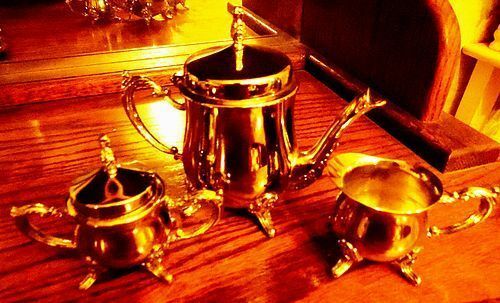 This little silver plated set is by Godinger Silver Art Co. and consists of: a teapot that is 5" high 6" across the spout and handle, a creamer that is 2 1/4" high, 4" across spout and handle and a two handled lidded sugar server that is 3 1/8" high and 5" across the handles. Perfect condition. Sorry about the lighting in the photo. The set is a shiny silver color, perfect and beautiful!! 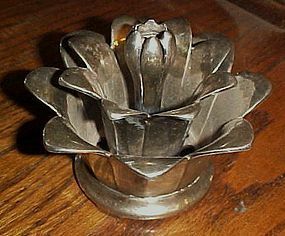 Vintage Wallace silver plate flower frog. This lovely flower frog is in the from of a blooming flower with two layers of petals and a center bud. This is incredibly heavy and beautiful flower. In mint condition and its original intent is to be used as a flower frog flower holder. The extreme center could accomidate a candle also. Very pretty, it could truly stand on its own as a decorative piece. Marked Wallace 99. It will polish up beautifully guaranteed. 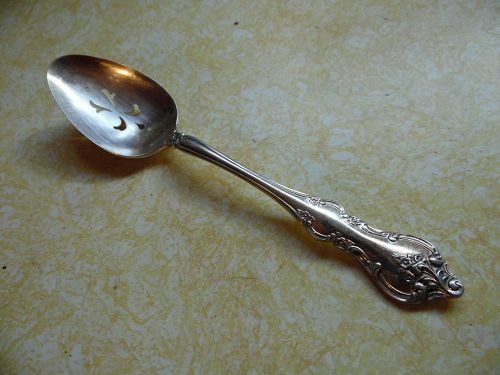 Nice vintage 1958 flatware pattern Precious Flower teaspoon by Revelation Silver plate. Measures 6 1/4" long. Very nice condition. I will have other pieces to this pattern. 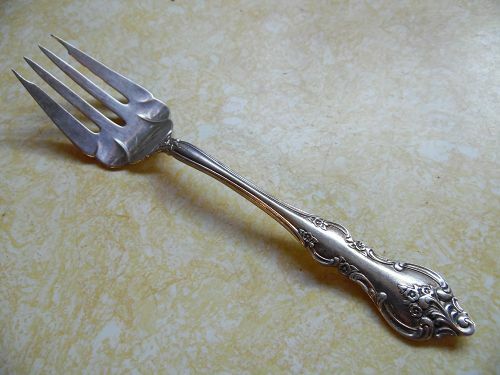 Nice vintage 1958 flatware pattern Precious Flower dinner fork by Revelation Silver plate. Measures 7 1/4" long. Very nice condition. I will have other pieces to this pattern. 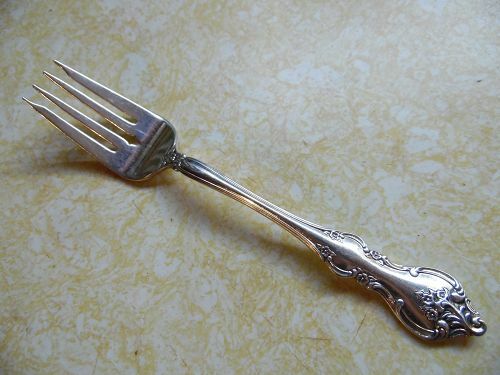 Nice vintage 1958 flatware pattern Precious Flower large cold meat fork by Revelation Silver plate. Measures 8" long. Very nice condition. I will have other pieces to this pattern. 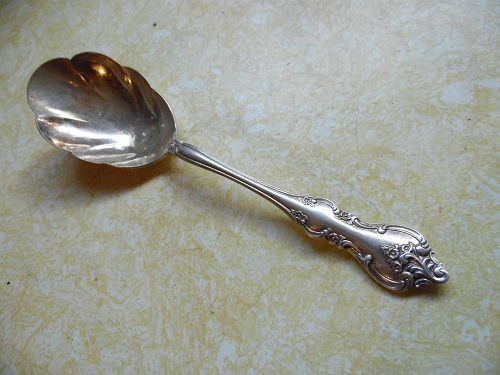 Nice vintage 1958 flatware pattern Precious Flower large oval serving spoon by Revelation Silver plate. Measures 9 1/2" long. Very nice condition. I will have other pieces to this pattern. Vintage King Edward silver plate flatware pattern circa 1951 by International Silver. This is the individual flat butter knife or spreader. Measures 5 3/4" long. Some scratches but still good condition and polishes up nicely. I have 4 available.